"Back in the late 1980's, my wife and I visited Giverny. 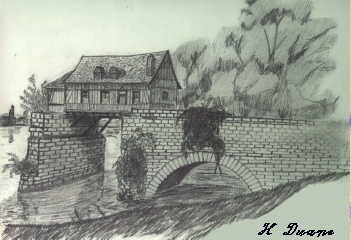 On a side trip to Vernon, I saw this house on a broken bridge, and sketched it. I often wondered what the story behind this house was, but only found out today when I accessed your web site. What a fascinating story and history this mill has. It was a very nice experience to visit your country and countryside. I especially enjoyed the warm and friendly people."